Col. Angela Suplisson, Air Force Test Center vice commander, and Bill Gray, Air Force Test Pilot School chief test pilot, pose for a photo in front of a TPS F-16. Suplisson graduated from the TPS in 1995 and is set to retire later this year. Have fun, try something new, and give back and mentor are three parts that make up Col. Angela Suplisson’s life mantra. Suplisson currently serves as the vice commander of the Air Force Test Center, headquartered at Edwards Air Force Base, Calif. Of the three tenets of her mantra, she said giving back and mentoring is the most important. Being in an academic environment at the U.S. Air Force Academy allowed her to do just that. Prior to serving as the AFTC’s vice commander, she served at the USAFA in Colorado. 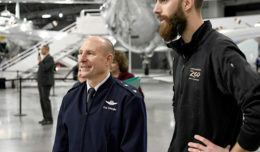 While at the academy, she served as the head of the Department of Aeronautics, the USAFA UAS Center director and as an assistant professor. Suplisson’s career spans multiple assignments. She has been involved flight testing the F-15, F-15E, F-16 and even the F-117. She said it would be difficult to simply pick one or two most memorable assignments, however she does admit one of the most memorable ones include her time at the University of Lyon III, in France, under the Olmsted Scholarship program, due to a life-changing event. Suplisson was a Distinguished Graduate in the French Basic Course at the Defense Language Institute in Monterey, Calif., in 2001. She earned a Master’s degree in International Policy and Strategy following her time in France in 2003. Another personal memorable experience was working on ejection seat testing, hypersonic weapons testing with the 846th Test Squadron at Holloman Air Force Base, N.M., and automatic ground collision avoidance systems. 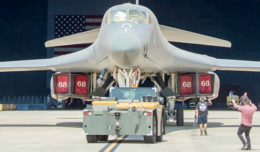 She said the Mach 6 runs down the track were especially fun because they involved almost all of 120-person squadron to execute the mission planning, setup, execution, tear down and data analysis. “It was teamwork at its finest,” she said. Suplisson also had a small role in the development of Auto-GCAS for the F-16. That small role would eventually lead her to research and develop an Auto-GCAS algorithm for larger aircraft; transports, tankers and bombers, for her Ph.D. The eventual goal of the research is to prevent controlled flight into terrain accidents in all heavy military aircraft, she said. Throughout her career she has seen big changes in how more women are in leadership positions. Women were not integrated equally with the Air Force until 1976. Women had previously served with the Women of the Air Force, and the Women’s Army Corps as aviators before that. Suplisson said she felt lucky to not have to face many challenges as a woman in the Air Force. A lesson she learned and wishes to impart to a new generation would be to set goals and also to ask for help. Col. Angela Suplisson, Air Force Test Center vice commander (left), speaks to military veterans at a monthly meeting of Coffee4Vets, a non-profit veterans support organization. 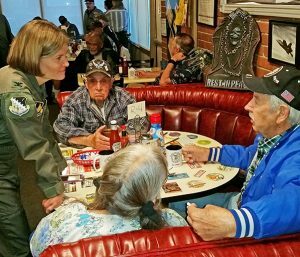 The weekly meetings are held Tuesday mornings, at Crazy Otto’s restaurant in Lancaster, Calif. 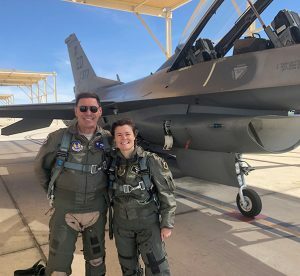 Early in her career, Suplisson had set a goal to enter the Air Force Academy, then to become an engineer, be commissioned as a lieutenant, graduate Test Pilot School and eventually become a squadron commander. However, before she could take off on her journey, she faced turbulence early on when she failed the Air Force Academy candidate fitness test, specifically the pull-up. She also would encourage young people to explore the field of Science, Technology, Engineering and Mathematics (STEM) and to also consider the Air Force as career choice. Suplisson is thankful for her Air Force family, and especially for her own family. Family has been one of her priorities, along with faith and friends. Her priorities have kept her resilient throughout her career during many challenges. “I would like to say thank you to all the people that believed in me and supported me — my family, friends, supervisors and teammates throughout the years. I could not have accomplished anything I have in the Air Force without the tremendous support of my parents, brother and sister, and my husband and sons. Later this year, Suplisson is set to retire and bid farewell to her Air Force family after almost 30 years of service. She said her final assignment as the AFCT vice commander at Edwards was fitting, considering it had been a launching pad for her career into the testing world.